Home Culture Edinburgh Magic Fest will reappear next year! 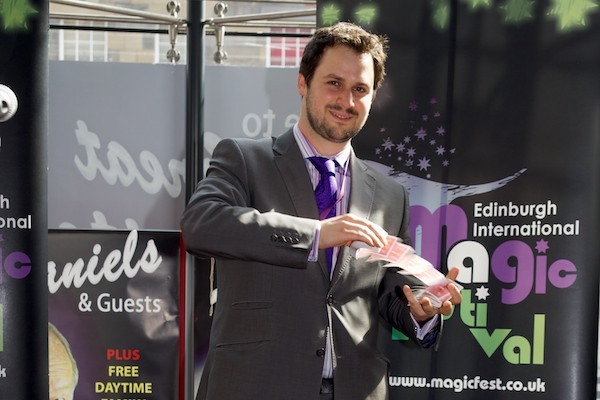 Edinburgh Magic Fest will reappear next year! The Edinburgh International Magic Festival will once again take place during the first week of the school summer holidays. Running from 29th June – 6th July, MagicFest 2012 will bring more amazing magic acts from all over the world to the Capital. The 2011 festival enjoyed another year of growth, doubling its audience to bring live magic to more than 5000 people in the city, proving there is a strong appetite for quality live magic in the UK. MagicFest opened with a sell-out Magic and Variety Gala Opening, including performances by John Archer (Former Magic Circle Stage Magician of the Year) and Frenchman Xavier Mortimer, and closed with the hugely anticipated sell-out “Four Nations Magic-Off” which saw the UK’s top comedy magicians fight it out! This year the champ was Portuguese performer Michael Neto. One of the festival’s major success stories this year was Magic School which enjoyed twice as many attendees year on year, attracting nearly 200 budding wizards aged 7-12. Magical workshops, from the president of Edinburgh Magic Circle Gary James, proved so popular that several students booked into more than one class, just to hone their skills! As a result organisers will expand Magic School by introducing week long workshops and creating “Street Magic Master Classes” for older children and teenagers. MagicFest’s prestigious sleight of hand competition “War of the Wizards” attracted competitors from all over the UK and was hotly contested. The under 18 winner Chris Dougall, from Lanarkshire, will be mentored by Kevin McMahon and the over 18 winner Alan Rorrison, from Port Glasgow, will have the opportunity to present a show at next year’s MagicFest. The Edinburgh International Magic Festival 2011 mostly relied on private donations, ticket sales, in kind support, funding from “Arts and Business” and organiser’s own contribution. In order to grow and develop the festival, MagicFest aims to attract a headline sponsor for 2012, offering suitable brands a strategic and creative opportunity to engage with consumers and align their brand with the UK’s only public-facing Magic Festival.